When I was pregnant with our first kid I was a little disappointed to find that I had almost zero cravings. Aversions aplenty, but nothing that I needed to eat. Not that I didn’t try to convince my husband that really it was the baby that wanted pop tarts, but we all knew I was just looking for an excuse to eat terrible food. They say every pregnancy is different, and I totally get that now. I don’t know how I thought things would go this time around, but I’m starting to realize that I wasn’t expecting any of what’s happened so far. 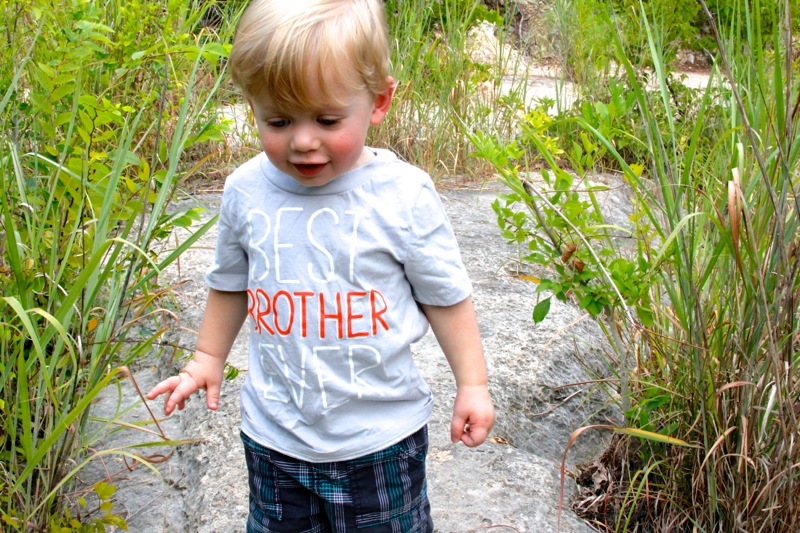 If I had no idea what to expect, it’s safe to say – he’s got absolutely no idea what we’ve gotten him into. I had no idea how exhausted I would be. I mean, maybe I should have seen that one coming – making a human is hard enough, but making a human while chasing a tiny one around all day is bound to wear on you. Can’t wait till I’m chasing two of them around all day – it’s going to be rad (and I’m sure I haven’t got a clue about how exhausting that will be either). Along with no cravings last time, I also conveniently skipped over the morning sickness phase. Not so much this time, and by not so much it’s safe to say that I would rename “morning sickness” to “all the time sickness.” It’s a double edged sword – hungry all the time, but no desire to eat ANYTHING. I just kept reminding myself that this was all normal, and a good way to know that things were progressing like the should. So here we are, 12 weeks in and I’m experiencing yet another new thing (now that all the time sickness is subsiding) – cravings. I eat a fairly rounded diet, and I know that when you crave something it’s the baby’s way of saying “hey, I need this,” but I never expected this baby to need steak. Like NEED. Many of my spare thoughts for the last few days have been consumed by, “I could really eat a steak right now.” It’s weird to be so obsessed with a specific food. Well, this is a food blog – so maybe not so weird. As we sat down to our steak dinner tonight (baby gets what baby wants), I looked across the table and told my husband how determined I was to get that steak, and how I thought that made it taste even better. It made me realize that this steak was not the only thing I became hyper focused on. When I need the perfect recipe for frosting to go with my favorite cake I will scour books and the internet for recipes, pour over people’s recommendations and adaptations, test, taste, and tweak a recipe until it’s exactly what I want, and I’m not satisfied until it’s everything I had been craving. Here’s the result of one of such endeavor. Start by making the caramel. It’s simple, but requires your full attention along with some time to cool before you can incorporate it into the frosting. If you add it while it’s too warm you’ll end up with melted frosting. In a medium pan over medium heat place the sugar & water. You can stir with a wooden spoon just until the sugar is melted. Once the sugar water is boiling you’ll want to set your spoon down and only swirl the pan occasionally as you wait for it to change to a dark amber color. While you’re waiting for it to turn to that lovely, dark amber color use a basting brush to run water down the sides of the pan if you see crystals start to form. You don’t want crunchy crystals in your smooth frosting at the end. Once you’ve got that nice amber color going – maybe 10-15 minutes – turn off the heat and whisk in the heavy cream until the caramel is smooth. Finish by whisking in your sea salt. 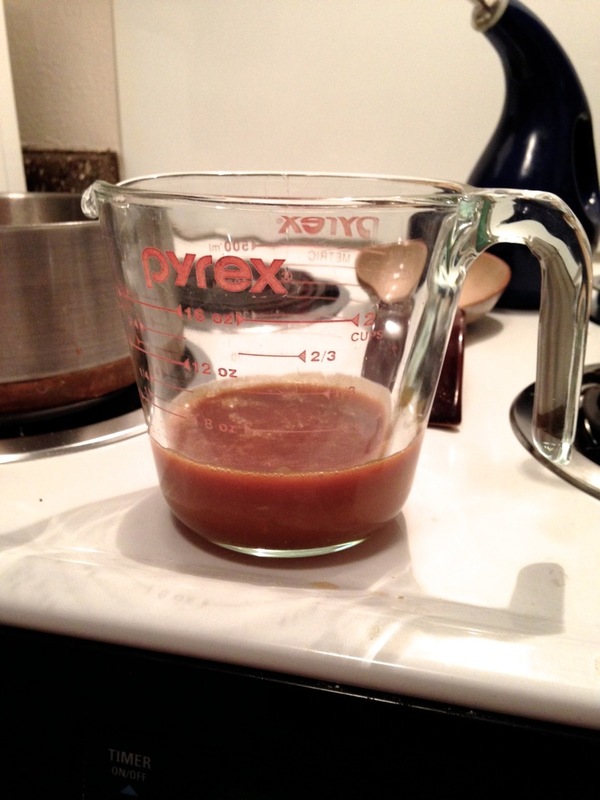 Transfer your caramel to another container to cool. It doesn’t have to be cold, but it definitely shouldn’t be hot anymore. You should end up with roughly 1/2 cup of salted caramel. Try not to eat this with a spoon…it’ll be difficult, but I believe in you. Now onto the frosting! This is another recipe that at certain times requires your full attention – I wouldn’t suggest multitasking. Start by combining your egg whites, sugar, and salt in a heatproof bowl, or the bowl of your stand mixer, and placing said bowl over a pan of simmering water. Toss in a candy thermometer and whisk the egg white mixture until the sugar has dissolved and the thermometer reads between 140°-160°F. If you don’t have a thermometer you can go by feel – the sugar should be dissolved and the egg whites should be warm and smooth. You’ll want to whisk pretty much the whole time – not to whip up your egg whites, but to keep them from over cooking and curdling. On it’s way to deliciousness. Now you can place the bowl back on the stand mixer, and if you have a stand mixer this is the part where you get to take a little break – the only time you don’t really need to babysit this recipe. 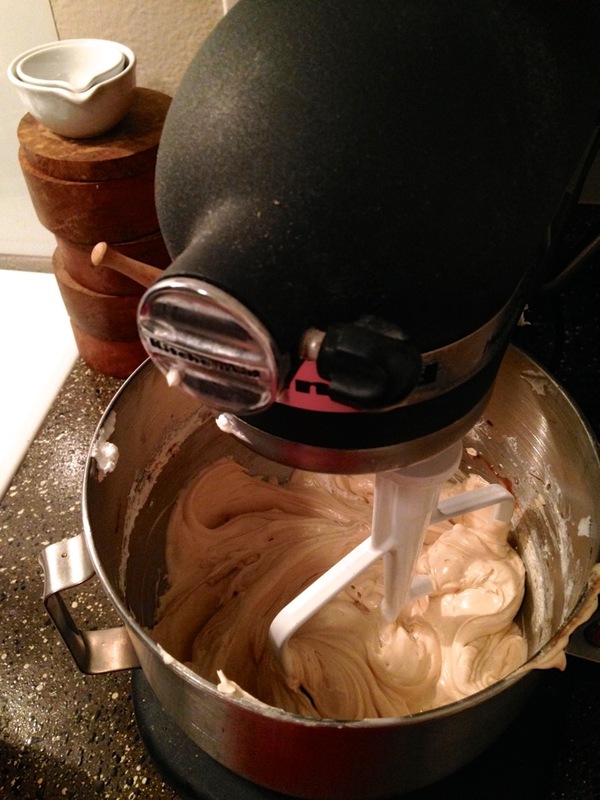 With the whisk attachment start the mixer on low and gradually increase the speed to medium-high. Now you can walk away for about the next 10 minutes as the mixture cools down (the bottom of the bowl should be cool to the touch) and whips itself into glossy, stiff peaks. Take a break while someone(thing) else does the work for a change. 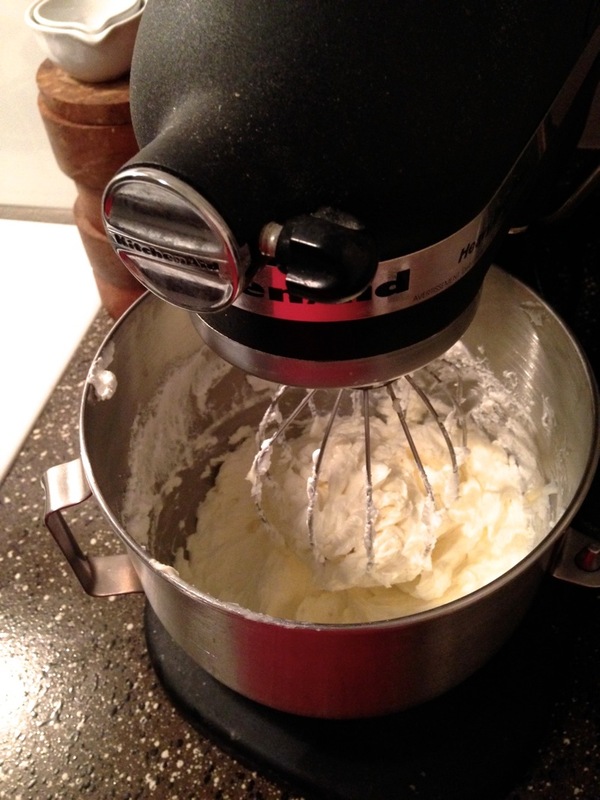 With the mixer on low you can now add your butter 1-2 Tbsp at a time. The butter should be nice and soft before you start this – otherwise it will have trouble being incorporated. Wait until each addition of butter is completely mixed in before adding the next bit – if you’re impatient sing happy birthday to yourself in-between butter additions. Scrape the bowl as necessary. Also, I wouldn’t recommend doubling this recipe – it doesn’t translate well into a double batch. Learn from my mistakes…my messy, tear filled mistakes. Now don’t freak out. Meringue buttercreams have a nasty habit of looking like you’ve completely ruined them before turning around at the last minute and looking wonderful. Adding the butter to your glossy, stiff peaks of egg whites and sugar is going to make those beautiful peaks wilt almost immediately. It will probably look like soup. Then it will most likely look like it has curdled. Then a light at the end of the tunnel – it starts to thicken – only to curdle again. NOOOOOO! Be patient, by the time you add the last piece of butter and let it whip itself back up you’ll have a nice, thick frosting that is a little shiny, and very inviting. After all the butter is incorporated you can stir in the vanilla. You can now pour in your cooled caramel. It will be messy, but it’s okay – all those little threads of sticky caramel will make their way into your fabulous frosting – scrape the bowl and whisk as needed. Once all the caramel is mixed in switch to the paddle attachment and beat on low speed for 2 minutes to get rid of extra air bubbles. Here it is in all it’s smooth, shiny, salty, caramely goodness. You can store this in the fridge in an air tight container with a lid for a week or two, just make sure you let it come to room temperature before rewhipping it. But why wait?! I like to pipe mine right onto 24 delicious chocolate, chocolate, chocolate cupcakes. These little beauts were achieved with a 1A round tip – it’s the largest one I could find. It’s not the one that you get in a set of tips, I had to go to a specialty shop and purchase it separately. I think those lovely little dollops of frosting create the perfect canvas for sprinkles. Yep, that’s what that cupcake needed. 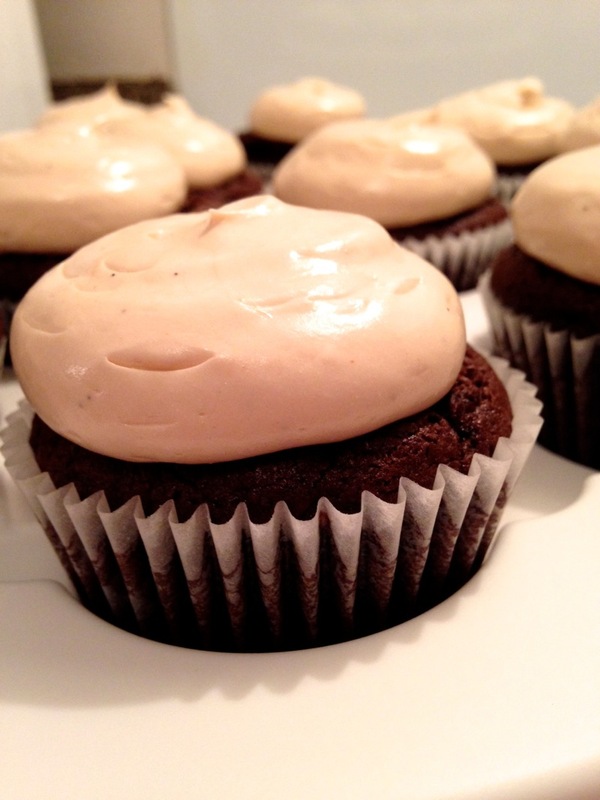 If you’re feeling like you need more salted caramel in your life (and who isn’t feeling that?) you can double the caramel batch and reserve half for drizzling over the tops of these little bites of heaven – pre sprinkles of course. I’ve done it before – totally delicious. 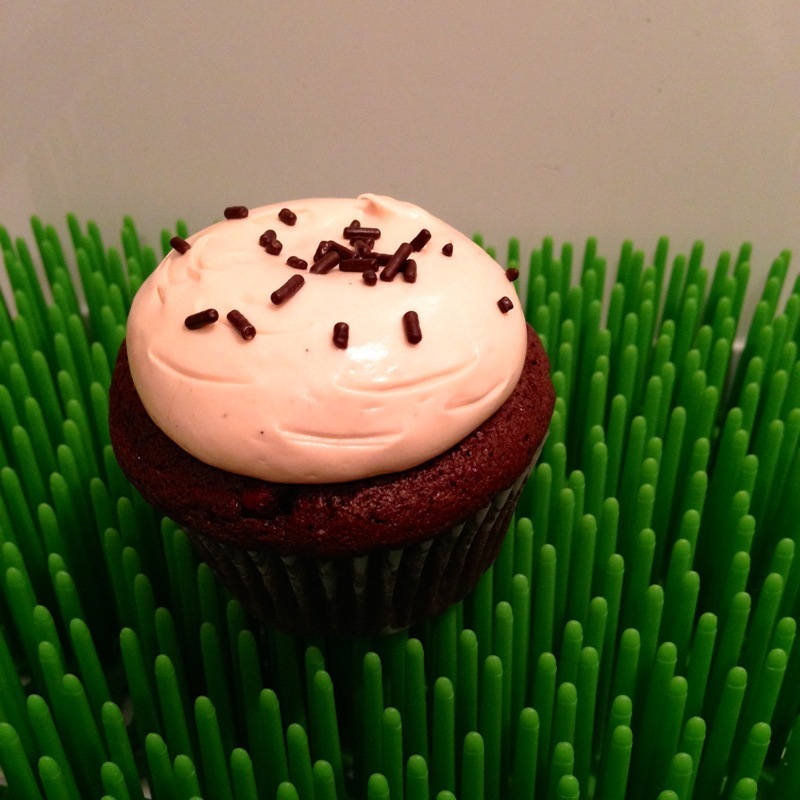 So I hope my craving for perfect frosting fulfills your craving for delicious cupcakes. Enjoy!! Thanks!! I really enjoy writing this blog, even though my posts have been fewer and farther between as of late.